A historical first visit to Kansas City by a Philippine Ambassador to the United States will occur on the weekend of September 26-28, 2015. 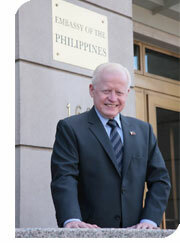 Ambassador Jose Cuisia's visit will be timely as the Sampaguita Debutantes Ball sponsored by the Filipino Association will be held on September 26 at the Marriott Hotel in downtown Kansas City, Missouri. He will be accompanied by his wife, Maria Victoria Jose Cuisia and the Philippine Trade Minister and Economic Officer to meet with the World Trade Center of Kansas City business council on September 28. On September 27, the Ambassador and his party will have an opportunity to visit the Filipino Cultural Center where a community mass will be held. They will view our cultural exhibit and meet with the Filipino-American youth, something he specifically requested. The FA-GKC will host a merienda reception, co-sponsored by the Filipino Cultural Center Foundation, the Philippine Medical Society and the Philippine Nurses Association.